The presence of chatter vibrations is one of the main limitations of machining processes in terms of productivity, as they prevent obtaining the required surface finishes and decrease the life of tools and the mechanical elements of the machine. The use of active dampers governed by a control strategy permits an increase in structural damping without significantly changing the machine design. The main objective of this study is to improve the dynamic capabilities of the machine, and to increase the chatter-free region. This objective is achieved by the addition of an electromagnetic actuator located as close as possible to the cutting point. The electromechanical design of the actuator is described, and a novel double flexure guarantees a constant gap between the moving magnets and the coils. 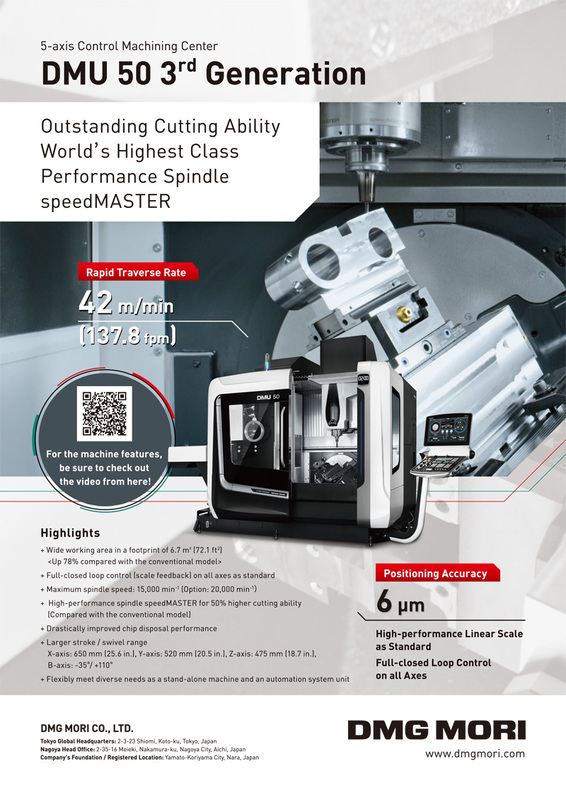 This smart mechatronic system allows the introduction of new additional functions: process and machine monitoring, chatter avoidance by spindle speed modification, and machine dynamics calibration. All of these functions enhance standard milling machines. I. Mancisidor, X. Beudaert, G. Aguirre, R. Barcena, and J. Munoa, “Development of an Active Damping System for Structural Chatter Suppression in Machining Centers,” Int. J. Automation Technol., Vol.12, No.5, pp. 642-649, 2018. J. Munoa, X. Beudaert, Z. Dombovari, Y. Altintas, E. Budak, C. Brecher, and G. Stepan, “Chatter suppression techniques in metal cutting,” CIRP Annals – Manufacturing Technology, Vol.65, No.2, pp. 785-808, 2017. J. P. Den Hartog, “Mechanical Vibrations,” McGraw-Hill, 4th edition, 1956. N. D. Sims, “Vibration absorbers for chatter suppression: A new analytical tuning methodology,” J. of Sound and Vibration, Vol.301, pp. 592-607, 2007. J. Munoa, X. Beudaert, K. Erkorkmaz, A. Iglesias, A. Barrios, and M. Zatarain, “Active suppression of structural chatter vibrations using machine drives and accelerometers,” CIRP Annals – Manufacturing Technology, Vol.64, No.1, pp. 385-388, 2015. A. Cowley and A. Boyle, “Active dampers for machine tools,” CIRP Annals – Manufacturing Technology, Vol.18, No.1, pp. 592-607, 1970. C. Ehmann and R. Nordmann, “Low cost actuator for active damping of large machines,” IFAC Conf. on Mechatronic Systems, Berkeley, USA, 2002. C. Brecher, A. Schulz, and M. Week, “Electrohydraulic active damping system,” CIRP Annals – Manufacturing Technology, Vol.54, No.1, pp. 389-392, 2005. T. Q. Thanh, D. Q. Truong, N. M. Tri, and K. K. Ahn, “Development of a Novel Linear Magnetic Actuator,” Int. J. Automation Technol., Vol.8, No.6, pp. 864-873, 2014. X. Sabalza, J. Munoa, I. Mugica, R. Uribe-Etxeberria, and R. Lizarralde, “Incremento de la capacidad productiva de las fresadoras mediante la reducción del efecto del chatter utilizando actuadores inerciales,” XV Congreso de Máquinas-Herramienta y tecnologías de Fabricación, San Sebastian, Spain, 2004 (in Spanish). N. Loix and J. P. Verschueren, “Stand alone active damping device,” Actuator 2004 – 9th Int. Conf. on New Actuators, Bremen, Germany, June 14-16, 2004. M. Baur and M. F. Zaeh, “Development and experimental validation of an active vibration control system for a portal milling machine,” 9th Int. Conf. on High Speed Machining, San Sebastian, Spain, March 7-8, 2012. J. Munoa, I. Mancisidor, N. Loix, L. G. Uriarte, R. Barcena, and M. Zatarain, “Chatter suppression in ram type travelling column milling machines using a biaxial inertial actuator,” CIRP Annals – Manufacturing Technology, Vol.62, pp. 407-410, 2013. M. Zaeh, R. Kleinwort, P. Fagerer, and Y. Altintas, “Automatic tuning of active vibration control systems using inertial actuators,” CIRP Annals – Manufacturing Technology, Vol.66, No.1, pp. 365-368, 2017. F. Claeyssen, G. Magnac, and O. Sosnicki, “Moving iron controllable actuators,” Actuator 2008 – 11th Int. Conf. on New Actuators, Bremen, Germany, June 9-11, 2008. I. Mancisidor, J. Munoa, R. Barcena, X. Beudaert, and M. Zatarain, “Coupled model for simulating active inertial actuators in milling processes,” The Int. J. of Advanced Manufacturing Technology, Vol.77, Nos.1-4, pp. 581-595, 2015. J. Munoa, M. Zatarain, I. Bediaga, and R. Lizarralde, “Optimization of hard material roughing by means of a stability model,” Proc. of 8th CIRP Int. Workshop on Modelling of Machining Operations, Chemnitz Germany, May 10-11, 2005. C. R. Fuller and A. H. von Flotow, “Active control of sound and vibration,” IEEE Control Systems, Vol.15, No.6, December 1995. S. Huyanan and N. D. Sims, “Vibration control strategies for proof-mass actuators,” J. of Vibration and Control, Vol.13, No.12, pp. 1785-1806, 2007. A. Bilbao-Guillerna, A. Barrios, I. Mancisidor, N. Loix, and J. Munoa, “Control laws for chatter suppression in milling using an inertial actuator,” Proc. of ISMA 2010 – Int. Conf. on Noise and Vibration Engineering, Leuven, Belgium, September 20-22, 2010. R. Kleinwort, M. Schweizer, and M. Zaeh, “Comparison of Different Control Strategies for Active Damping of Heavy Duty Milling Operations,” Procedia CIRP, Vol.46, pp. 396-399, 2016. I. Bediaga, J. Munoa, J. Hernández, and L. N. López de Lacalle, “An automatic spindle speed selection strategy to obtain stability in high-speed milling,” Int. J. of Machine Tools and Manufacture, Vol.49, No.5, pp. 384-394, 2009. T. Delio, J. Tlusty and S. Smith, “Use of audio signals for chatter detection and control,” J. of Manufacturing Science and Engineering, Vol.114, No.2, pp. 146-157, 1992. I. Bediaga, I. Egaña, and J. Munoa, “Reducción de la inestabilidad en cortes interrumpidos en fresado a alta velocidad mediante variación de la velocidad del husillo,” XVI Congreso de Máquina-Herramienta y Tecnologías de Fabricación, San Sebastián, Spain, 2006 (in Spanish). R. F. M. Marçal, M. Negreiros, A. A. Susin, and J. L. Kovaleski, “Detecting Faults in Rotating Machines,” IEEE Instrumentation & Measurement Magazine, Vol.3, No.4, pp. 24-26, 2000. M. J. Devaney and L. Eren, “Detecting motor bearing faults,” IEEE Instrumentation & Measurement Magazine, Vol.7, No.4, pp. 30-50, 2004. I. Bediaga, X. Mendizabal, A. Arnaiz, and J. Munoa, “Ball Bearing Damage Detection Using Traditional Signal Processing Algorithms,” IEEE Instrumentation & Measurement Magazine, Vol.16, No.2, pp. 20-25, 2013. I. Bediaga, X. Mendizabal, I. Etxaniz, and J. Munoa, “An Integrated System for Machine Tool Spindle Head Ball Bearing Fault Detection and Diagnosis,” IEEE Instrumentation & Measurement Magazine, Vol.16, No.2, pp. 42-47, 2013.